A history of hurling. On the weekend of the All-Ireland hurling final it seems only fitting that the history of Ireland’s national game are discussed. Hurling is arguably the fastest field sport in the world and quite possibly the oldest. It is played with sticks called hurleys, a ball known as a sliotar, and by two teams of 15 who play on a large pitch with goals at either end. The rules of the modern game were first codified by the Gaelic Athletic Association in the late 19th century but prior to this there were actually two hurling traditions on the island of Ireland (see O’Maolfabhail, 1973). In the north of the country a winter game, very similar to modern Scottish shinty, was played mainly on the ground with a narrow stick and a hard ball. The second form of the game, or Leinster hurling, was played with a broader hurley and a softer ball and was much more like the modern game. Players could pick up the ball, catch and strike it as well as soloing down the field. 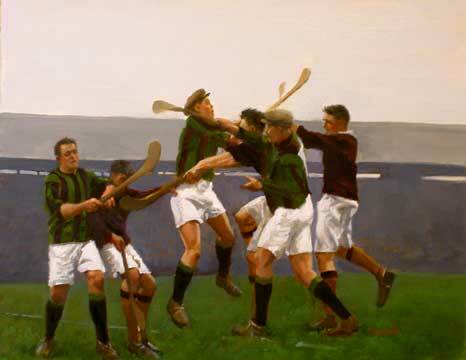 Although the GAA used both forms as an inspiration for the game it organised in the late nineteenth century, Leinster hurling had more of an influence in the evolution of the game (O’Sullivan 1998, p. 32). However, which of these games is the oldest remains a mystery. The earliest surviving references to hurling are found in 7th and 8th century AD Irish laws, which describe various sporting injuries that should be compensated. Hurling is also mentioned in the 11th/ 12th century Leabhar na hUidre, while further descriptions are to be found in 13th/14th century romantic tale Cath Mhaigh Tuireadh Chunga (ibid, p.33). This latter account details a very bloody hurling game between the Tuatha De Danna and the Fir Bolg that was played at Moytura, Co. Mayo. This mythical match supposedly took place in 1072 BC! (the Bronze Age). However, the most famous early account of the hurling is found in the Tain Bo Cuailgne, which describes the exploits of the Ulster hero Cú Chullainn. Although the surviving version of this epic dates from the 12th century it has been convincingly argued that the story’s origins lie in the Iron Age (500 BC – 400 AD). Hurling is mentioned a number of times in the text, most notably when the young hero, then known as Setanta, uses a hurley and sliotar to kill a vicious hound. 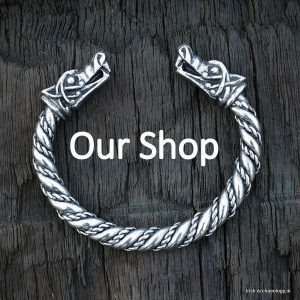 Hence forth he became known as Cú Chulainn (Cullen’s hound), after the owner of the dog. 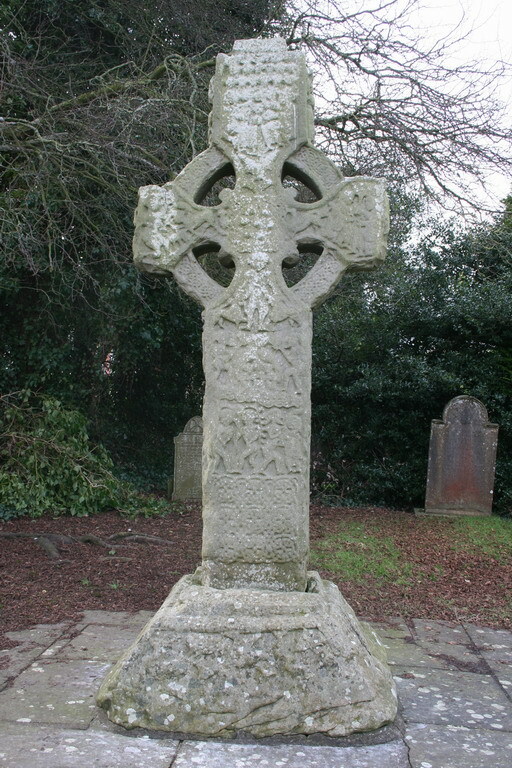 Possible representations of hurling are also found on two high crosses from Kells and Monsterboice, which date from 9th/10th centuries AD. On each of these crosses a biblical panel is depicted which illustrates David killing a lion with what appears to be a curved stick and ball. The killing instrument should in fact be a sling, but it appears that a hurley was chosen instead as it may have been more familiar to an Irish audience (O’Sullivan 1998, 34). Hurling continues to feature in Later Medieval Gaelic Irish and English sources, with the latter generally disapproving. It is hard to believe it now but in the 14th century that bastion of the modern game, Killkenny, attempted to ban hurling. This occurred in 1367 when the infamous Statutes of Kilkenny declared ‘do not, henceforth, use the plays which men call horlings, with great sticks and a ball upon the ground, from which great evils and maims have arisen’. Despite threats of fines and imprisonment, this law failed miserably and the black-and-amber-clad men of Kilkenny would become one of hurling’s powerhouses. Similar measures to curtail hurling were also undertaken in Galway. These statutes, which were enacted in 1527, stated that people should ‘At no time to use ne occupy ye hurling of ye litill balle with the hookie sticks or staves.’ Thankfully, as in Kilkenny these laws seem to have had little lasting effect. Indeed, the game appears to have been widely played in the latter middle ages. 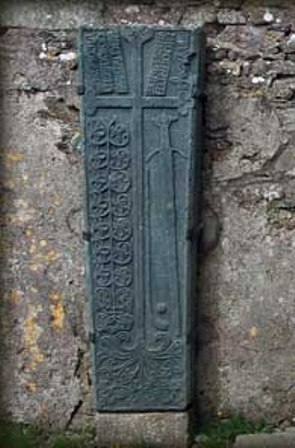 In the far north of the country, for example, a 15th century Galloglass’s grave slab from Co. Donegal clearly depicts a sword, hurley and sliotar (see image to the left). Similarly in the south of the country, hurling was so prevalent, that the Lord Chancellor William Gerrarde was forced to reprimand the English settlers of the Munster Plantation for playing the game in 1587. In the post-medieval period hurling continued to prosper, often under the patronage of the Anglo-Irish gentry. These matches drew large crowds and many colourful accounts of these games survive. For example, in 1792, ‘a hurling match took place in the Phoenix Park’, Dublin in front of a vast ‘concourse of spectators’, with ‘much agility and athletic contention, until the spectators forced into the playing ground’. (King 2005, p. 18). Similarly in 1827, a game at Callan, Co. Kilkenny is described thus, ‘It was a good game. The sticks were being brandished like swords. Hurling is a war-like game. The west side won the first match and the east the second. You could hear the sticks striking the ball from one end of the Green to the other’ (diaries of Amhlaoibh Ó Súilleabháin). Inter-village and sometimes inter-county hurling matches flourished throughout the 19th century. Indeed, they were to inspire a new and dynamic sporting organisation. In 1884, nearly 2000 years after Setanata first drove a sliotar towards Cullen’s onrushing hound, the Gaelic Athletic Association was founded. The rest, as they say, is history. We are hoping that it would be ok to link to the pages on hurling as the Ireland Canada Monument specifically will recognise the contribution of hurling to Ice Hockey in Canada in 1800. We hope to link from the Monument website to the Irish Archeological Website and also to include a link in our newsletter for the same. Feel free to link to the article/website Brendan. Glad you liked it. I enjoyed your article on the history of Hurling but wondered if the reference to the Gallowglass gravestone at Inishowen in Donegal was a little inaccurate? The stick displayed on the stone is actually the longer, more slender Shinty caman, fom the Scottish form of gaelic field sport, rather than the shorter, broader hurley. The gentleman who the stone commemorates was Manus MacMorisdean from Iona. Thanks for the comment Roddie. I suppose we don’t really known what 15th century hurleys in Ireland looked like, but in the north of the country where ‘winter hurling’ (in essence shinty) was played they were probably very similar to the Scottish caman. In fact in Irish we still call a hurley a Camán. The shorter, broader modern hurley in contrast is based mainly on the southern ‘Leinster hurling’ stick. I suppose I’m just using the modern Hiberno-English word hurley as a catch all phrase to describe these early playing sticks. The man who made the grave slab was Ferghais mac Allain, who I’m guessing was a Donegal man and as you rightly said he dedicated it to Manas Mac Mhoireasdain of Iona, who was obviously an excellent ‘winter hurler’/shinty player. Two things please. The definitive history of hurling is Scéal na hIomána by Liam P.Ó Cathnia. I know it’s in Irish, but it’s still the definitive history. Secondly, on Easter Monday 1209 to quote James Ware – the Bristolins of this Cittie (Dublin), and other Englsih inhabitants of the same, had by ancient custome a sport which they called hurleing of balls, and which they exercised upon Festivall Dayes. These Bristolins challenged another partie of the Cittie to hurle with them on Easter Monday. In Cullenswood – today’s Ranelagh – the native Irish ambushed the hurlers, and killed several hundred. Apologies – six months late!!! This stone had long lain buried under the soil. I remember seeing it when quite a little boy, and I was at service in the now ruined church. and placed where it is. This would account for the golf-stick and ball, which were unknown in Ireland, and quite suit with the title upon the stone. It’s an interesting story Paul, I’d never heard it before, thanks for the link. A stolen headstone? it’s possible. Perhaps it is rather ingenious – not to mention tenuous – for the GAA to trace its codifed games as a continuous line back to ancient Irish myth. Hurlling was codified by the GAA in 1884, 21 years after the Football Association codified football. Some here might prefer to call it “soccer”. I’m sure, if you looked hard enough you might find some ‘ancient’ references to people kicking bags of air around too. As for hurling: Setanta, the Fir Bolg and all these other fictional characters could just have been playing the forerunners of hockey or cricket. Myths are called myths for a reason. The Game is Brilliant NOW!! what ever the past. Like ALL History the base of it is on some written ? verbal facts & Myths. Thank you for this! I’m doing a project, a booklet, on a particular sport, about Hurling seeing as no one believes me when I say that it is one, haha! Paul provides a curious tale about the appearance of the MacOrriston Stone at Cloncha but it simply doesn’t seem plausible. I think we have to take a close look at our, now respective, histories. The north of Ireland was heavily settled by Gaels from the Scottish Highlands and islands from the 13th century onward to counteract the effects of Anglo-Norman colonisation. 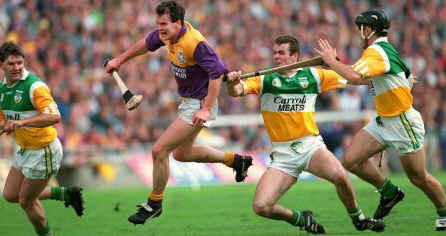 As Colm has stated, we simply don’t know what a Hurley of that period looked like. The caman on the stone is not a golf club (golf being a much later development and unknown in the Highlands until the probably the 19th century) but a Shinty stick. The sticks used today are identical in size and form. 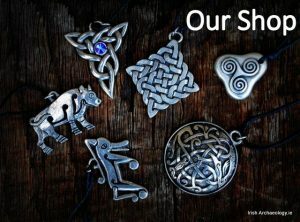 My understanding of the development of Gaelic stick games in Ireland is that up until the formation of the GAA, the game which predominated north of a line from Galway to Dublin was Camanachd (referred to in All About Ireland as “Commons”), currently regarded as a game of the Scottish Gaidhealtachd. We have to get away from the Scottish history/ Irish history trap. During this period, we are talking about a culture region. It is interesting to note that when Robert the Bruce, himself a Gael, living in Carrick, then very much part of the Scottish Gaidhealltachd, sent a letter to the Chiefs of Ireland for support, he referred to the Scots and the Irish as being, “our nation, speaking one language”. My own name, regarded as being peculiarly Highland (in Scotland, at least, in this spelling), is Mac Gille Fhinnein, “Son of the devotee of St Finnan”. No prizes fro St Finnan’s origins! We share a wonderful, common heritage. Let’s celebrate it, in its entirety. Not to dampen Hurley Duncan’s enthusiasm for his Irish ancestry at all, but his first name ‘Hurley’ sounds more likely to have come from an ancestor whose surname was [in English] Hurley. Many Irish people called Hurley are descended from the Gaelic name Ó Iarlaithe which was often anglicised to ‘Hurley’. This has nothing to do with the game of hurling or ‘hurley’ as it is sometmes called. Mentioning how Leinster Hurling was adopted by the GAA, reminded me of folklore local to my area on how the Leinster was named and how hurling was involved. Legend goes that in a pre-Christian era, there was a fierce rivalry in one of the major clans in current day Carlow. A coup by the nephew overthrew the incumbent leader leading to gruesome blood letting. The chief’s grandson being his only survivor. The boy was so traumatized by the events that he lost the power of speech. Banished from the kingdom, the boy fled with a few followers, and the clan bard, to the South West of the country. The group took refuge on an island in the middle of what is now known as Lough ine. The boy grew up without ever recovering the power of speech, until, you guessed it, while playing a game of hurling. Mid-match when he received a clatter across the shins the youth was compelled to vocalic his rage. Immediately the locals named him Labhair na Lionsaigh, the mute who speaks. In time the youth returned to the area of his birth regained his clan and by a mixture of war and magic grew the kingdom to include most of the current day counties of Carlow, Kilkenny, Wexford, Wicklow, Kildare and Dublin. His reign was so successful that in time his name became synonyms with the region. Lionsaigh after two thousand years becoming Leinster.